Contents page states publication on the 10th of the preceding month. The cover illustration is for a story contest. 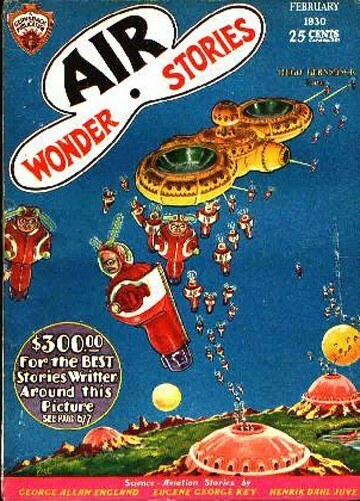 The first-prize-winning story was "The Red Plague" by P. Schuyler Miller, which appeared in Wonder Stories, July 1930. Cover art is credited to "Paul" on the contents page; signature "Paul" is on the artwork. Interior art is credited below each art item. Story art for "The Vanishing Fleet" on page 678 is credited and signed "Paul." Story art for "The Red Ace" on page 692 is credited and signed "Paul." Story art for "Liners of Space" on page 704 is credited to "Ruger"; the artwork is signed "Jno Ruger." The story is credited to "J. Vanny" on the story, but as "Jim Vanny" on the contents page and in the caption of his drawn portrait. Story art for "The Flying Legion (Part 2 of 4)" on page 714 is credited to "Paul"; the artwork shows no signature. "Berlin to New York in One Hour" is translated by Francis M. Currier. The artwork (pages 744, 745, and 746) is uncredited and unsigned. Drawn portraits (uncredited and unsigned) of the authors appear with each story. "What Is Your Knowledge of Aviation?" is a list of questions about aviation. With each is listed the story page number on which the answer can be found. "The Reader Airs His Views" is a letters column. "Aviation Forum" is also a letters feature, but deals more narrowly with aviation questions. Note: The letter by Kelly on page 763 is attributed to "Frank M. Kelly." However, both this author and letter author "Frank K. Kelly" in the October 1929 issue of this magazine have an address of Kansas City, Missouri. Therefore it is assumed that the two are the same person.